The last almond almost went to Joules. I knocked it off the highest twig, scarcely reachable by my trusty ‘fruit hook’, and it fell into a clump of grass. Joules was right beside me. He bristled as if he’d heard the rustle of a lizard, then before I could stop him, pounced and grabbed something. I wasn’t sure whether it was my benchmark-setting almond, or nothing in particular. But whatever it was, he wasn’t going to let me have it. In these situations I’m sadly powerless. My only recourse is to invoke a more impressive authority. Clive was still in the house but it didn’t matter. Without hesitation, Joules spat out the almond. Almond number 308. Not for canine consumption! We took the risk and removed Taylor’s Elizabethan collar. He immediately celebrated by making a madcap career round the orchard and across the courtyard, coming to a cartoon-like skidding halt by the car and spraying it with gravel. Seeing as I’d just that moment finished washing and waxing the car, I wasn’t too pleased. But it served me right as it had been my idea to take the collar off. Taylor is a huge tease. His main motive in making the dash round the orchard, apart from celebrating his freedom, was to tease Joules. 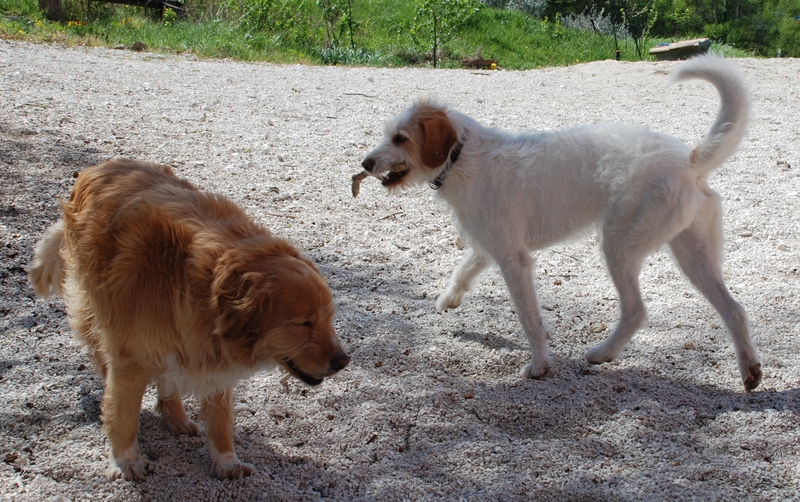 He often grabs a stray object such as a bit of old stick and with a: “Nyer, nyer, can’t have it, catch me if you can!” goads Joules into chasing him. Joules is no slow-coach but he can’t compare with that white electric streak. He has, however, learnt to take a short-cut across Taylor’s wild orbits and bar his way. Much to Taylor’s glee! A pomegranate is a good companion to watching a tv football match, I find. There’s a certain mindless rhythm to picking out the seeds which helps to soothe my anguish at the injustices meted out to our favoured team, Chelsea. 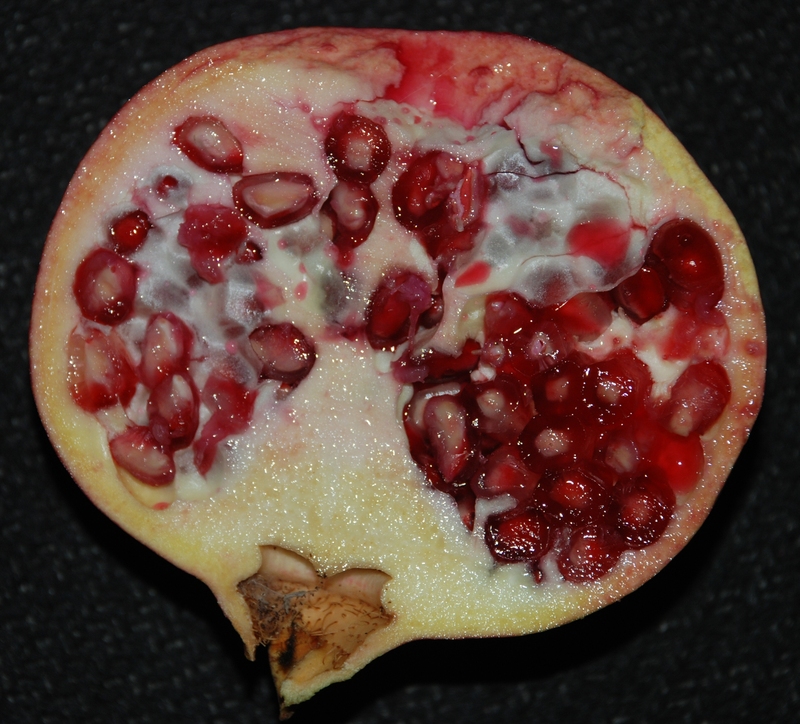 Although, come to think of it, a pomegranate isn’t the most rewarding of fruits. The hard white grains rather spoil the experience of the juicy globules. The pomegranates I’m eating at the moment aren’t quite ripe. I’ve picked them because they split open while still on the tree. Taylor, our youngest dog, has been licking and licking a scratch in his right arm-pit until it’s red and sore. Finally, in despair, we’ve put an Elizabethan collar on him. Collar, bonnet, helmet – all words we use for the wretched thing which inconveniences us as well as him. He doesn’t seem to have minded it much this time, though: perhaps he’s just resigned to his imprisonment. I read once that the wound-licking instinct in predators is adapted to the amount of time that a wild animal would normally have for it. An African hunting dog, for example, tired from the chase and on pup-rearing duty perhaps, would lick a wound enough to keep it clean and no more. Whereas our leisured Taylor over-eggs the pudding, so to speak. 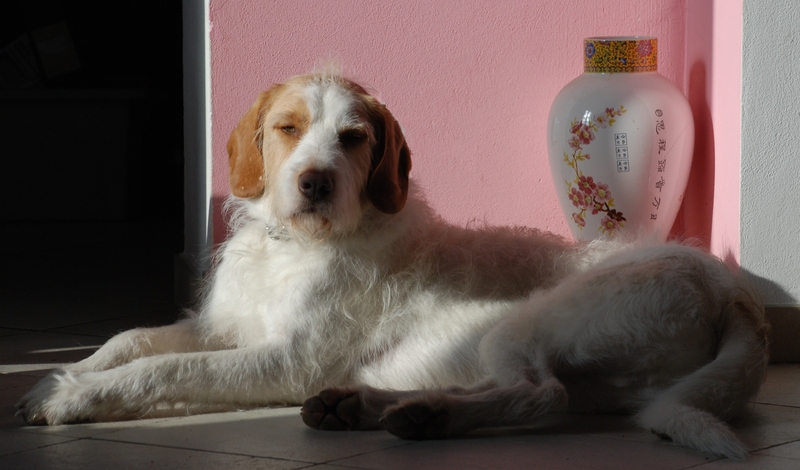 In the photo he isn’t wearing his contraption, but his courtesan-like pose marks him out as a true dog of leisure. ‘Charlotte’s Web’ is one of my favourite books. Charlotte is the spider who saves the pig Wilbur from routine slaughter by means of her magical ability to incorporate words into her web. At the end of the book she entrusts the egg sac containing her 514 offspring to Wilbur’s care before she dies. 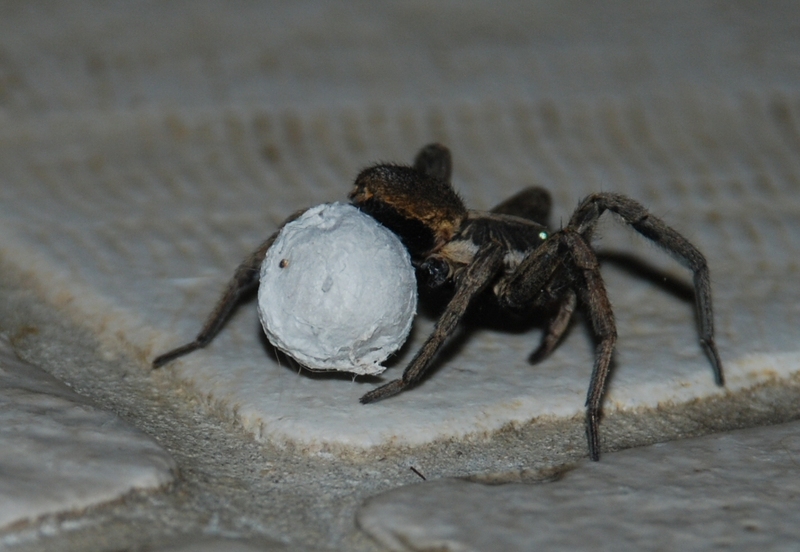 I think Charlotte’s egg sac was probably bigger than the one in the photo, but then this is a portable one. The mother spider is carrying it about with her: I just managed to get this shot of her before she disappeared under Clive’s desk. It’s been a disaster of a day, mainly because of the water cut which started last night. I’d planned to do a couple of loads of washing, put the dishwasher on, wash up the pots and pans that don’t fit in the dishwasher, and wash my hair – all standard Sunday activities, all thwarted. Although the water came back on just after lunch, it almost immediately went off again, presumably nicked by someone refilling their private reservoir. Meantime I’d started the dishwasher up but had to turn it off again and trap all the dishes inside. Then it started to rain which meant I couldn’t relieve my frustration by doing some gardening. Clive, meantime, had soldiered away at peeling the mountain of tiny peaches we’ve accumulated. He proceeded to turn them into a 3-kilogramme cake. At least something good came out of today. 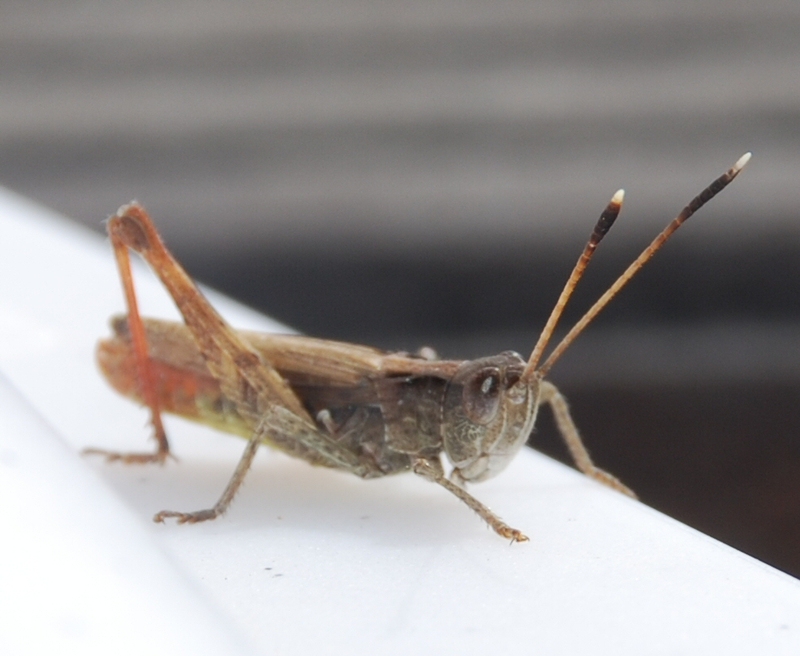 It must be by a phenomenal leap that grasshoppers make it over the side of our above-ground pool. Once in the water, they’re like sailors who deliberately don’t learn to swim so as not to suffer: they drown almost immediately, quite unlike most other insects. But that’s not accounting for the monster who inhabits the pool from time to time. She (not that they know it’s a she, or even an animate being) sometimes makes it in time to fish them out … and they’re free! Wheeee! They jump a couple of meters – 20 times their own length. Right back into the water. The monster rescues them again and this time points them in the direction of the blurry green world beyond the turquoise blue one. Sometimes – very rarely – a grasshopper sits still for a while to recuperate and reflect on its inadequacies. That’s how the photo came about, which is of a very small grasshopper, the sort that is especially athletic.